INSANITY MAX:30 includes 150 NEW MOVES to help you dig a little deeper and get your body in the very best shape of your life! This workout combines Cardio and Strength Training WITHOUT using any equipment at all!! HOW?!?! You body is your equipment for this workout! All you need is the Program and YOU!! The program is 60 days long and is broken down into Month 1 and Month 2. THe workouts are all 30 minutes each with a 10 Minute Ab workout. This program is not about making it all the way through the entire 30 minutes, but to "MAX OUT" and GO HARD until you have to take a break! THEN you aim to increase that time the next day! Who can do INSANITY MAX:30? Anyone that is ready to start their fitness journey with an INTENSE workout. It does have a MODIFIER. If you've completed Insanity and love it, or if you are a T25 grad and are ready for more of a challenge, then this is for you! Order through a Team Beachbody Coach and receive Sweat Fest Workout for FREE -- CLICK HERE! 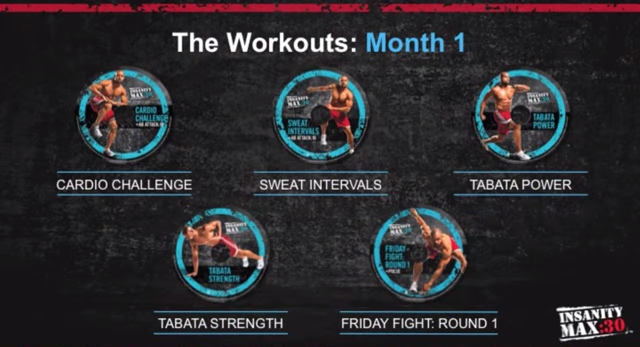 The workouts in the first month of a combo of cardio and tabata style strength workouts. Your goal is to beat your time from the day before! It is 20 seconds on and 10 seconds off with the workout structure. 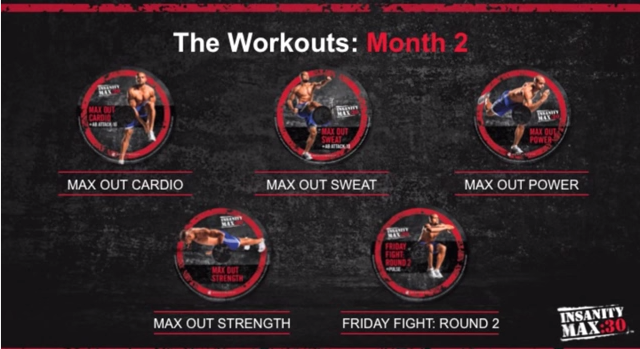 The second month is all about taking it to the MAX and challenging yourself to the max! Now the intervals are 45 seconds on and 15 second off, challenging both endurance and strength. To "Max Out" means to stop or fail for the first time in the workout. It's really not about getting through all 30 minutes. It's about going as hard as you can, for as long as you can, until you MAX OUT! Write down the time take a creak, and then you want to jump back into the workout. If you stay committed and push to your max you will add ore time each week with the workouts! MAXING OUT IS A GOOD THING!! What Comes with the Kit and How Much does it Cost? Order the Base Kit Now -- CLICK HERE! 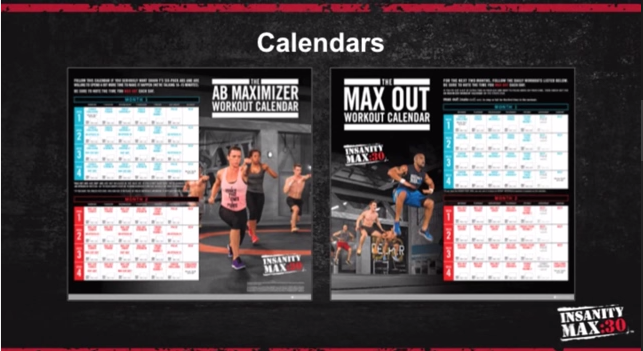 12 Workouts on 10 DVD's, MAX Out Nutrition Guide, Restaurant Guide and a Wall Calendar. 60 Day Program, 30 Days of workouts in each block. OPTIONAL Saturday Workout: Pulse workout - Focus on core, balance and form. Five 1/2 minute intervals with rest. Tabata Workout: 45 seconds on and 15 second rest, 6 rounds and an extra something at the end! Because psychologically you want to see your progress! You want to to see each week how far you went and if you went 1 or 2 minutes longer. You can always have a challenge for yourself! Flexible Eating and Portion Control. Super easy to follow, effective and crucial to your results! 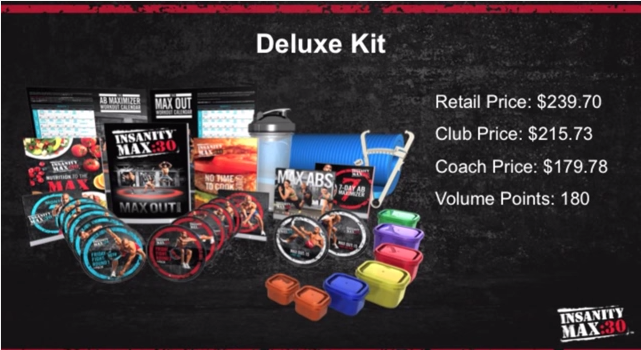 ***Deluxe Kit: Comes with 3 Extra Workouts and the Portion Controlled Containers! SO, how can you get it? 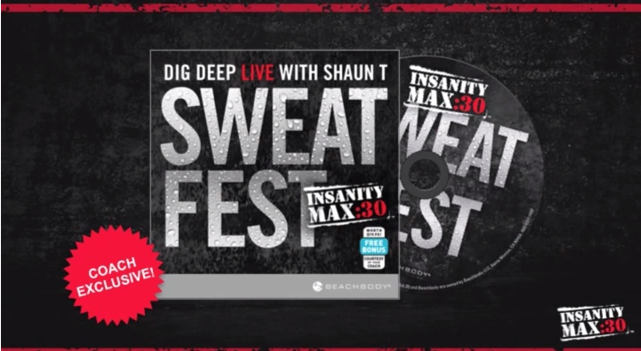 INSANITY MAX:30 CHALLENGE PACK You will receive the INSANITY MAX:30 Base Kit fitness program, Shakeology, and a free 30-Day trial membership to the Team Beachbody Club, where you can stream your workout anytime, anywhere! 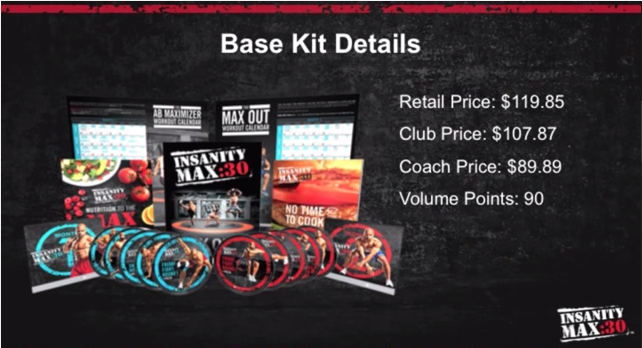 INSANITY MAX:30 DELUXE KIT You get everything in the INSANITY MAX:30 Base Kit, plus three additional workouts for insanely shredded abs. You'll also get Shaun T's exclusive Ab Maximizer plan, an essential Core Comfort Mat to provide support while you carve out every inch of your six-pack, and unique portion-control tools to help simplify eating so you can get the body you want, not matter what your goals are! 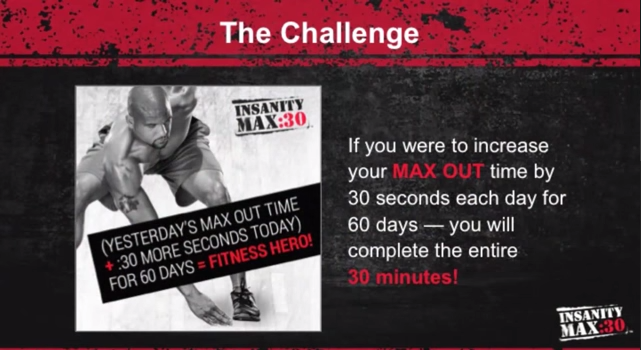 INSANITY MAX:30 KICKSTART CHALLENGE PACK You will receive the INSANITY MAX:30 fitness program, a 3-Day Refresh kit, Shakeology, and a free 30-Day trial membership to the Team Beachbody Club, where you can stream your workout anytime, anywhere! If you don't already have a Team Beachbody Coach, MAKE ME YOUR COACH HERE! What will you get from me being your Coach? You will have access to my PRIVATE CHALLENGE GROUP, held in a closed online Facebook group, along with other people on the same journey -- to get healthy and in shape!! No one but the members of the group can see what is being posted. I will help you prepare ahead of time for your start of the workout. We will take measurements, before photos and meal plan together. 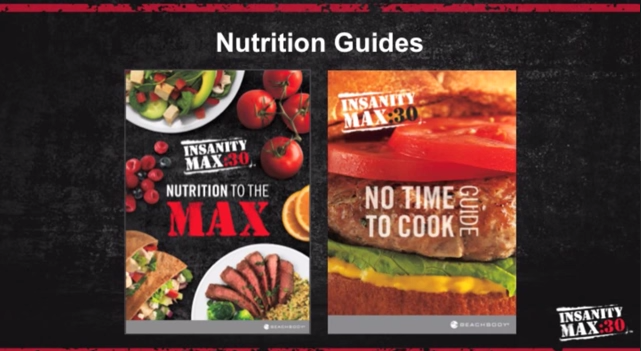 I will also provide you with a nutrition guide, recipes and LOTS of motivation and support! We will take small steps to get you toward your ultimate goals. It's about progress OVER perfection!